Boy Scouts approved a plan to accept openly gay boys as Scouts, according to AP. At its National Council met in Grapevine, Tex., about 1,400 voting members on the council approved the change by a 60-percent vote. The policy change will go into effect next January. Under the proposal drafted by the Scouts' governing board, gay adults will remain barred from serving as Scout leaders. "Today, following this review, the most comprehensive listening exercise in Scouting's history the approximate 1,400 voting members of the Boy Scouts of America's National Council approved a resolution to remove the restriction denying membership to youth on the basis of sexual orientation alone," a Boy Scouts of America statement read in part. The outcome is unlikely to end a bitter debate over the Scouts' membership policy. Some conservative churches that sponsor Scout units wanted to continue excluding gay youths, in some cases threatening to defect if the ban were lifted. More liberal Scout leaders while supporting the proposal to accept gay youth have made clear they want the ban on gay adults lifted as well. The vote will have major national implications and a deep impact on one teenage Scout in Moraga. Discussion of the policy that lead up to Thursday's vote has split conservatives who denounce the proposal and gay-rights supporters who say they welcome the possible change but want the ban on adult leaders to be lifted as well. About two dozen people calling on members to vote "no" stood outside the resort, while supporters of the change met across the street. The vote was watched closely in the Bay Area in part because of Ryan Andresen. Last year, the teen's Eagle Scout application was rejected because he was openly gay. He has become a focal point for much of the country as this issues moved through the scout organization. He even appeared on the popular Ellen DeGeneres show. Andresen joined the Boy Scouts 12 years ago, and completed all the requirements to become an Eagle Scout, but was deemed ineligible to receive the award from Troop 2012 because he was gay. Despite support from heavy hitters such as U.S. Sen. Barbara Boxer, a national representative for the Boy Scouts said that Ryan Andresen did not meet membership standards, and therefore is not eligible to receive the rank of Eagle. 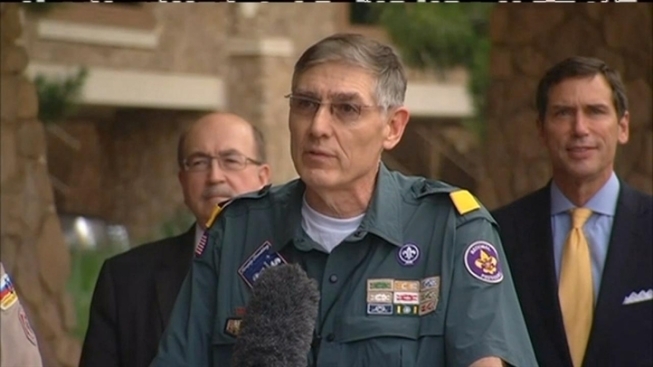 When the Scouts announced the organization's readiness to change some of its policies in January, Andresen's father, Eric Andresen, told NBC Bay Area that he welcomed any positive changes to open scouting doors to gays and lesbians. But he said at the time that an incomplete acceptance of Scouts - without accepting gay adult leaders - was a "baby step" and a bullet that shouldn't be dodged. "For 103 years, the Boy Scouts of America has been a part of the fabric of this nation, with a focus on working together to deliver the nation's foremost youth program of character development and values-based leadership training. Based on growing input from within the Scouting family, the BSA leadership chose to conduct an additional review of the organization's long-standing membership policy and its impact on Scouting's mission. This review created an outpouring of feedback from the Scouting family and the American public, from both those who agree with the current policy and those who support a change. Today, following this review, the most comprehensive listening exercise in Scouting's history the approximate 1,400 voting members of the Boy Scouts of America's National Council approved a resolution to remove the restriction denying membership to youth on the basis of sexual orientation alone. The resolution also reinforces that Scouting is a youth program, and any sexual conduct, whether heterosexual or homosexual, by youth of Scouting age is contrary to the virtues of Scouting. A change to the current membership policy for adult leaders was not under consideration; thus, the policy for adults remains in place. The BSA thanks all the national voting members who participated in this process and vote. This policy change is effective Jan. 1, 2014, allowing the Boy Scouts of America the transition time needed to communicate and implement this policy to its approximately 116,000 Scouting units. The Boy Scouts of America will not sacrifice its mission, or the youth served by the movement, by allowing the organization to be consumed by a single, divisive, and unresolved societal issue. As the National Executive Committee just completed a lengthy review process, there are no plans for further review on this matter. While people have different opinions about this policy, we can all agree that kids are better off when they are in Scouting. Going forward, our Scouting family will continue to focus on reaching and serving youth in order to help them grow into good, strong citizens. America's youth need Scouting, and by focusing on the goals that unite us, we can continue to accomplish incredible things for young people and the communities we serve."